What is a 3 Wheel Walker? Most people are aware of the traditional walker, front wheel walkers, and 4 wheel walkers, but there’s an additional option that many are finding convenient and practical. Using a 3-wheel walker is a different experience, ideal for those who want greater and more flexible mobility. Its triangular shape helps it fit into a wide array of spaces, and when folded, it is easy to transport or store. What are the Benefits of Using a 3 Wheel Walker? There are several advantages to using a 3-wheeled walker rather than a traditional walker or one with 4 wheels. Three wheeled walkers give you greater and faster mobility than a standard walker. Standard walkers also require a certain level of strength and endurance since you need to lift them while you walk. Wheels solve this problem and make for a smooth, gliding experience. Compared to a 4-wheel walker, a 3-wheel rollator is more lightweight and portable. You’ll be able to move through narrow spaces since you can pull the handles inward to reduce the walker’s width. You don’t need to worry about storing these walkers since they fit easily into car trunks and closets. While eating out, this type of rollator can be folded and placed next to a table or wall without causing any inconvenience. Three wheeled rollators also have a tighter turn radius, allowing you complete control and the ability to switch your direction as needed. This feature makes them perfect for indoor use, where you might need to navigate tight hallways and door frames. Are There Any Drawbacks to Using a 3 Wheel Walker? There aren’t many disadvantages to using a 3-wheeled rollator, but they may not be suited for some people or situations. In general, 3 wheel walkers usually have less support and a lower weight capacity. If you need to place a significant amount of your weight on a walker, 3 wheels might not be right for you. These walkers primarily help with balance. Bearing too much on one can make it difficult to maneuver. The the other main drawback to a 3-wheel walker is the absence of a seat. Since the design of these rollators is triangular, there is no space for a seat or backseat. 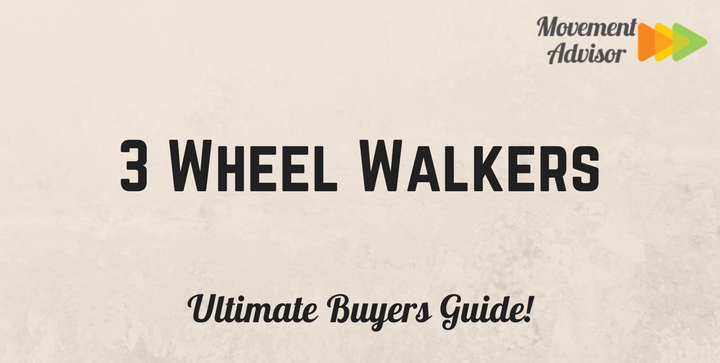 While shopping for a 3-wheeled walker, there are a few features you should keep in mind. A primary benefit of the 3-wheel walk is its small size and light weight. Look for a frame that supports this, made of a sturdy but lightweight material like aluminum. A lighter material also makes travel and transportation easy. You should measure the distance from your wrist to the floor to determine your ideal handle height. However, it’s a good to have some flexibility. Your height may vary slightly depending on the shoes you wear. You might also want to adjust the height to keep your wrists at a comfortable angle. Three wheel rollators allow for fast and flexible movement, but sometimes you may need to put on the breaks. Make sure the model you choose has break lock system that you’re comfortable using. Many rollators have a hand brake system similar to bicycle breaks. Loop locks are familiar and easy to use. You won’t want to worry about carrying a bag or purse, and with most walkers today, you don’t have to. There is a range of storage options from baskets and trays to zippered pouches. Choose a model with enough space to hold the personal belongings you need on your person. The Nova Medical Products’ 3 Wheel Traveler Walker has a weight capacity of 250 pounds and weighs just 16 pounds. Moving through different spaces and a variety of terrain is easy. This walker has large, 8-inch wheels for a stable and smooth ride. It has an adjustable handle height, with a range of 33 to 37.25 inches high. The handles are 12 inches wide, while the overall width of the Nova rollator is 24.25 inches. It is 23.75 inches long. The Nova has a significant amount of storage with a pouch, tray, and basket. You can get the Nova Traveler in black, blue, or red. Being foldable makes it easy to take this rollator anywhere. Even though it includes a basket and tray, these components are both removable. Drive Medical’s Winnie Lite offers a stylish choice, with a tan plaid pouch. This rollator also comes in flame blue and flame red with a black carry pouch. It can support up to 300 pounds. The Winnie Lite is 26 inches wide by 22.75 inches long. It has a 300-pound weight capacity. The walker height is 32 inches while the adjustable handle can be moved to be from 31 up to 38 inches high. Casters are 7.5 inches. Its loop lock system with an aluminum interior is safe and easy to use. The tires on this model are soft grip, which makes it suitable for indoor and outdoor use. 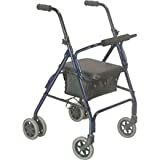 Contains (1) Carex Trio Rolling Walker, three-wheeled rolling walker for seniors. Lightweight, foldable & compact for easy maneuverability in tight spaces. Collapses quickly for storage & transport. Large storage bag & height adjustable handles. 7" wheels with locking brakes, one of the leading walkers in the category. The Carex Trio Rolling Walker includes a large storage bag with pockets for ID cards and cell phone. Transport yourself and your accessories with ease as you cruise through your day. It folds neatly and is a great choice for the elderly or handicap. The three wheel rollator features one wheel in the front and two wheels in the back. This adult walker is perfect for senior members of the family who still want their independence. The Walker 3 Wheel Trio from Carex is lightweight, foldable and easy to transport. Its compact design lets you store this walker when not in use, pack it into your trunk or backseats, and even set it next to your table in a cafe or restaurant. The Trio has a 250lb weight capacity. It measures 22 inches wide by 25.5” long. The height is adjustable from 31.75 to 38 inches, and you can do so just by pushing a button. The wheels are 7.5 inches, and the overall weight of the product is 7.5 pounds. This model comes in a deep blue color and includes an oversize storage bag with pockets that fit cell phones and IDs. The DMI 3 wheel rollator’s swivel front wheel gives users quick and easy mobility. You’ll be able to move smoothly through narrow spaces or crowded areas. When folded, the DMI walker takes up very little space, making it convenient for travel, including use in locations as diverse as airports to museums to cruise ship decks. You can activate its parking brake by pushing the handle down into the lock position. This walker weighs 15 pounds total. Its width is 26 inches at full extension, and its length is 28 inches. The height is smaller, at 10.50 inches, but the handle height can be adjusted. The DMI rollator has both a basket and detachable storage bag, with a plastic tray that fits on top of the basket. Available colors include burgundy and royal blue. It has ergonomic handgrips which contain no latex. The Lumex Sure-Gait II is made of steel that is chrome plated for a durable, but slightly heavier product. It weighs 18.5 pounds total and has a weight capacity of 300 pounds. 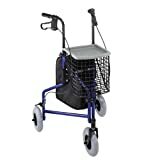 Its dimensions are up to 30 inches wide and 12 inches long, with the main body or the rollator extending to 26 inches high. The handle height is adjustable up to 37 inches. Sure-Gait II has large, 8-inch rubber wheels that help you navigate rough and uneven terrain. It has locking loop hand brakes and includes a standard storage pouch.